Beginning in the 1800s, government-sponsored religious schools were established to assimilate Indigenous children into Euro-Canadian culture. Children were removed from their families and placed in boarding schools where they were prepared for domestic and farm labour. The children were punished for speaking their Indigenous languages or practising their faith traditions. Mortality rates were high, and mental, emotional and physical abuse was common. Who was responsible for residential schools and their students? The schools were government-funded, but most often run by Anglican, Catholic, United and Presbyterian churches. Churches set up boarding schools as early as the 1620s, and the later government-sponsored schools were often set up close to existing missions. The Indian Residential Schools Settlement Agreement, announced in 2006, was the largest class-action settlement in Canadian history. The federal government approved a $2-billion settlement package for Indigenous people who were forced to attend residential schools. Approximately 87,000 people were eligible for compensation. What is the Truth and Reconciliation Commission (TRC)? The Truth and Reconciliation Commission was established in 2008 as part of the Indian Residential Schools Settlement Agreement. Its mandate was to document the truth of Survivors, families, communities and anyone personally affected by the residential school experience. The commission spent six years travelling throughout Canada to hear from Indigenous people who had been taken from their families as children and placed in residential schools. The commission released its six-volume final report in December 2015.
Who was affected by residential schools? First Nations, Inuit and Métis former residential school students, as well as their families and communities were affected by residential schools. The TRC heard from close to 7,000 witnesses, most of whom were Survivors who had attended the schools as students. How many children were enrolled in residential schools? Residential schools operated in Canada for more than 150 years. During that time, it is estimated that 150,000 children attended these schools, which were used as a tool of assimilation by the Canadian state and churches. Why is the TRC important to Canadians? Residential schools are a part of Canadians’ shared history. Canada’s relationship with Indigenous people has suffered as a result of the residential school system. Healing and repairing that relationship requires education, awareness and increased understanding of the legacy of the schools. How does reconciliation factor into the Truth and Reconciliation Commission mandate? The commission believes reconciliation is about establishing and maintaining mutually respectful relationships between Indigenous and non-Indigenous people in this country. For this to happen, there must be awareness of the past, acknowledgment of the harm that has been done, atonement for the causes and action to change behaviour. When did the last residential school close? The last federally run school to shut its doors was Gordon’s Residential School in Punnichy, Sask. It closed in 1996. What is the National Centre for Truth and Reconciliation? The National Centre for Truth and Reconciliation, located at the University of Manitoba, is the permanent home for all statements, documents and other materials gathered by the Truth and Reconciliation Commission. Staff at the NCTR use the gathered documents to ensure former students and their families have access to their own history, educators can share the residential school history with future generations of students, researchers can more deeply explore the residential school experience, the public can access historical records and other materials to help foster reconciliation and healing, and the history and legacy of the residential school system are never forgotten. 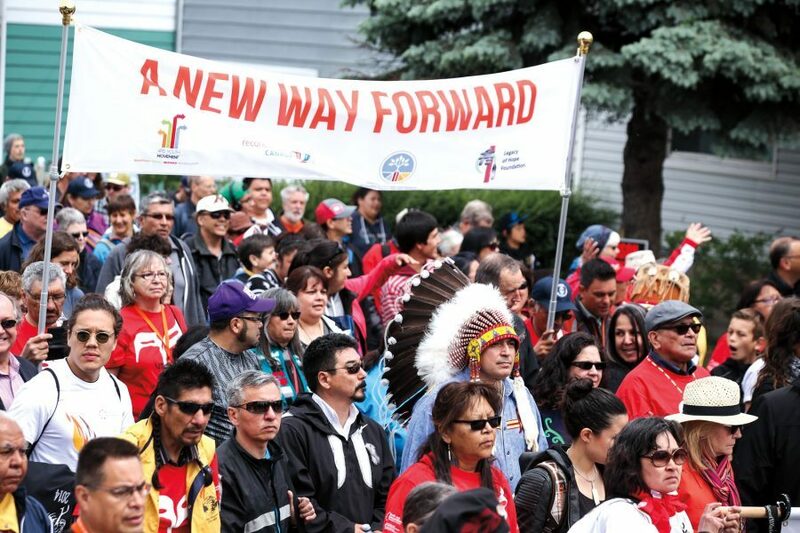 The Walk for Reconciliation in Gatineau, Que., May 31, 2015.